in the "Häuserl am Roan" area. It seems to be white almost all around the world right now! ,,, Very familiar sight! That's pretty amazing. Did you have Strauss playing on your iPod while you took these pictures?! The branches look like they are dancing and swaying to the Viennese waltz. What amazing photos! I just called my husband in here to look at these. They look like scenes from The Lion, The Witch, and the Wardrobe.......magical! And it looks COLD, COLD, COLD!! What's causing the snow to look like feathers in that last photo? That's a picture that needs to blown up and framed!!! Beautiful! Stay warm, Merisi. 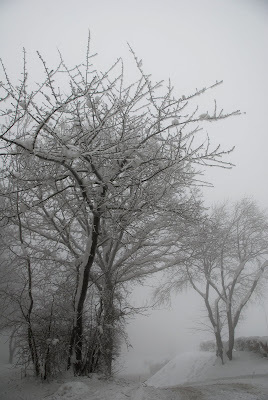 I see the fog is not unlike the ice fog I posted about last month, to make the beautiful frost on the branches. This is always an exquisite part of the winter months for me. Beautiful photos, Merisi. yes, Sue, it must have been one of the highest points along the road through the woods. It was white everywhere, but that particular spot appeared like a fata morgana. 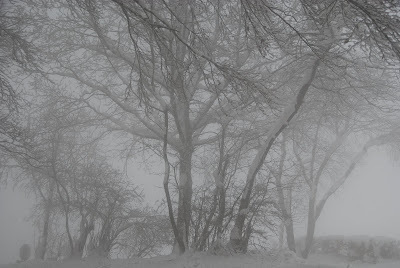 All of sudden, visibility was only a few hundred yards, at times even less as the icy wind chased clouds of fog. My fingers almost froze as I tried to hold the camera steady. It really was icy cold, with the wind blowing hard. I lasted only a few minutes. Those feathers were all over along the edge of the wood. My explanation would be that thow had set in earlier, causing high humidity. Somehow the temperature must have fallen quite suddenly. The icy wind then literally blew humidity into these magical forms. there was only the noise of the wind to hear! yes, the fog surely played a role in forming these exceptionally beautiful frost sculptures! Lovely. The last picture has the grace of a flock of birds in flight! I have always claimed I want to come back as a tree in my next life. You have captured the atmospheric starkness beautifully, so cold yet achingly inviting. I hope you took a good thermos flask along with you? What were you wearing going out in that blizzard? YSK or Sonia Rykiel or...? There is a grim beauty in these images. Shrinky: If you come back as a tree, perhaps it would be better to come as an olive tree or a tree in a warm climate. Those trees look very cold! That last photo is brilliant! Oh, how enchanting! Your blog and photos are just beautiful, Merisi. No less than mine, we simply have different subjects in view. Thanks so much for your visit to Pollywog Creek and your very kind words. I hope you return. Be blessed! Wow! Thanks for braving the cold and getting those photos for us--they're amazing! It looks positively "other-worldly!" Like walking right into a story book. And it DOES look really cold! Those pictures are awesome. It is inspiring an idea for a new scene in my novel. Oh, wow. Winter time in the woods. Thank you so much! Gorgeous winter woods photos. They look enchanted. That last shot is one of a kind...to see the wind-formed frost/ice on the branch.